Jac o' lyn Murphy: Just Dance in front of the Christmas Tree! Just Dance in front of the Christmas Tree! no picking out a Christmas dress for my daughter to wear with tights and patent leather shoes. but more for the break from school and the gifts. Unfortunately the "wonder" of it has faded. and loves the traditions of the Holiday. My daughter is almost 14 and is glued to her phone. She acts like Jack is silly for his Christmas Spirit. Just Dance on the Xbox! Just Dance is the only family "game" we can all agree on. It gets the kids out of their rooms and off of their phones and computers. especially my husband and I (we are terrible! ), and all tend to get a little competitive. I love that I can add a few new moves to my very limited dancing capabilities. The best part of the whole experience is how hard we laugh. giggling, dancing and letting loose. I think Santa Hats are going to be a mandatory boogie accessory. Amazon.com Gold Box Deal of the Day...TODAY! The girls can do 6 rounds of dance battles with the new battle mode too. feedback and a calorie counter. What a great idea for a party ... I love it! 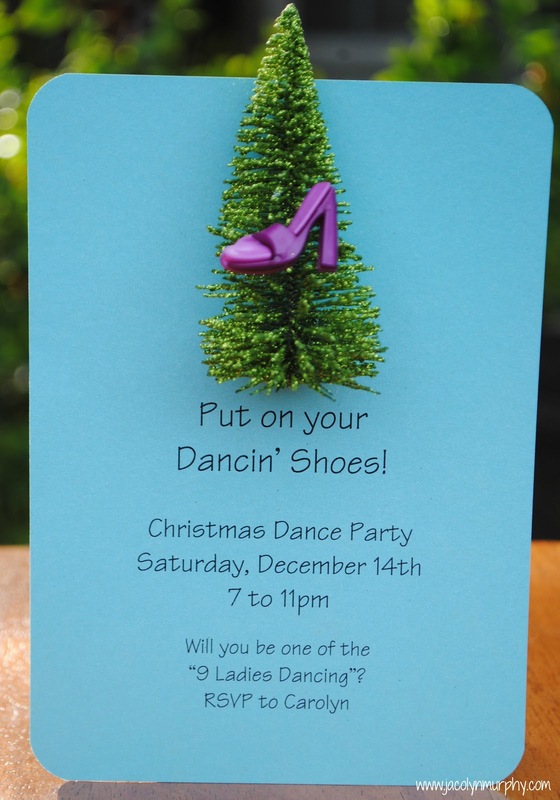 Love the plastic shoe on your invites!